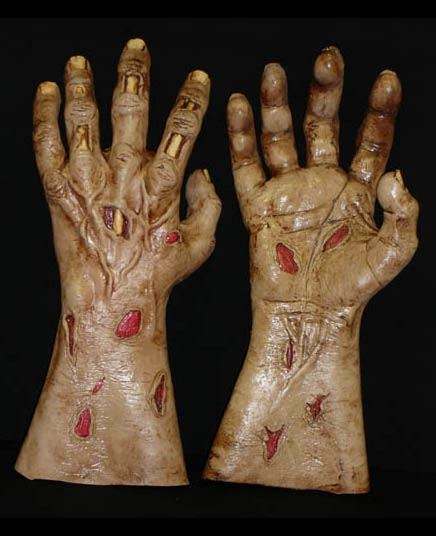 These are great zombie hands to use with almost any zombie Halloween mask. They are actually made to go with the Flesh Eater mask, so the coloring is perfect together. Arms are approximately 18" long. They have exposed flesh and bone on both sides of the hands - very well detailed. A great way to complete your zombie costume. Got these hoping they would be a great match for the Flesh Eater mask, which sadly, they are not. The paint is almost an olive green color and does not match the mask as well as claimed. These hands are also HUGE! Very loose and uncomfortable/awkward to wear. They come up quite high on your arm too which is not conducive to movement. If they were smaller and actually matched the Flesh Eater mask, they would have been a good buy.